During the winter months, having the right tire combined with winter driving conditions is going to result in an increase in driving safety. The tires you drive on and how you drive when there is snow and ice on the roads makes a big difference. Winter tires are designed with different compounds, blade and sipe technologies, and unusual tread patterns that help the tires grip the pavement when there is snow and ice present. They are designed to reduce your braking distance and minimize tire spin when you accelerate. Although many new cars exit the factory with “all weather” tires, these tires will not deliver the performance needed on wet ice and snow covered roadways. 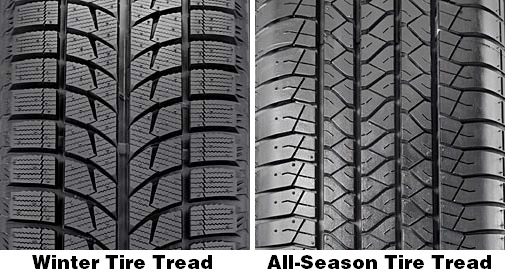 When taking a closer look at the above tire tread comparison, it becomes rather obvious of the difference between the two styles of tires. It is apparent that the winter tire tread is wider with deeper grooves that allow for better traction on wet and slushy roadways. Depending on when you make a purchase (yes, you need two sets), winter tires are about the same as the all season style of tires. 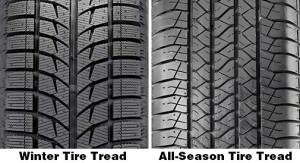 Making your winter tire purchase in the spring when dealers are motivated to move out inventory to make room for regular warm weather tires, will save you considerable money on your set of winter tires. Many dealers will now offer to warehouse your winter tires for you if you agree to allow them to mount them when the next snowfall is about to arrive. Typically, tire shoppers always purchase during a sale and the better sales take place when inventories need to be slashed to make room for other products. 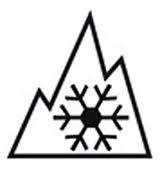 All winter tires have a designated symbol on the sidewall indicating that the tire has been manufactured to meet or exceed the specific snow traction performance requirements of the Rubber Association of Canada and should not be confused with the M + S designation that indicates the tire is designed for Mud and Snow. 1. Slow down. Most accidents in winter weather could have easily been avoided if the drivers involved had been driving much slower at the time of the crash. 2. Increase your distance from the vehicle ahead of you. Increasing your time to brake will greatly reduce rear-end collisions. 3. Watch drivers around you. It is remarkable that most drivers do not change their driving habits when there is snow on the road. For this reason, your awareness of other drivers will play a large part in avoiding accidents that result on snow covered roads. During the winter months, a good pair of snow tires is well worth the cost. However, just having snow tires does not mean that you can drive over what the current weather conditions allow. Remember: safe driving reduces the chances of a snowy auto accident. If you combine a pair of snow tires to your already safe driving habits, this will be a winning combination that usually equates to an accident-free winter. Stay Safe Out There This Winter!